Broadway Street S.W. on Thursday afternoon: Finishing the job. You will be relieved to hear that this is likely to be the last report on the great Southwest Broadway Street flood of 2016. Why? 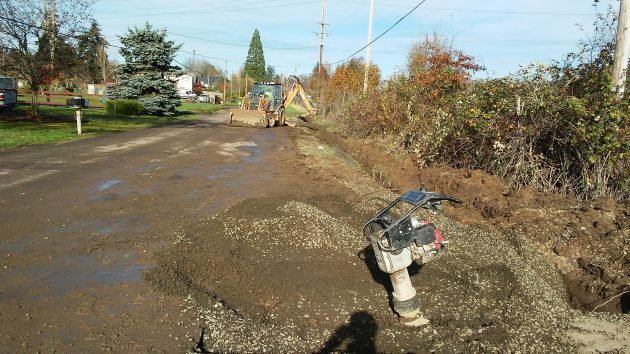 Because once Albany officials became aware of the problem, the city jumped into action, spent some days pumping away the ponding runoff, and on Thursday was finishing work on a permanent fix. The problem was that this fall, runoff from the undeveloped acreage of the U.S. Department of Energy east of the street was inundating the street and a neighboring driveway, then flooding properties to the northwest. Apparently an underground drainage pipe shown on maps from the 1980s had become clogged or collapsed. The solution was to pipe the water about 150 feet to an existing city storm drain to the south. From there it can flow into Oak Creek and the Calapooia River. Chris Bailey, public works director of operations, told the city council about the plan on Nov. 7. Ten days later it had been carried out. Common sense tells us that we ought to have a City Council composed of folks like Public Works Director of Operations Bailey. She became aware of a situation. She reported it to City Council. Ten days later, Bailey had fixed the problem and everyone was happy. The current occupants of Albany’s Power Base learned on November 9th that the citizens of Albany had voted overwhelmingly on a particular subject. Today is November 19th, precisely 10-days since Albany Overlords learned of Voter wishes, yet the Council has demonstrated that it is unable to comply with the wishes of the citizens. Perhaps it is time to, as Donny Trump puts it, repeal and replace those members of the Council who view the electorate with such contempt. It’s great when a plan comes together. Definition, solution, execution. Do you know if there has ever been plans to develop that area?